Fascinated by the myriad manifestations of energy, Giorgio has pledged allegiance to the Galaxy to rechannel its awesome power through the portals of his artworks. As an energetic surrealist, he deciphers levels of the reality matrix in meditatively levitative states, and captures the result in his imagery. The intensity of his art parallels that of his life. From day one without a moment of rest, turbulence has been his involuntary game. It fuels his romantic passion, his positive light on life, as much as its darker shadows, and most of all his burning expressive desire radiating from his art. As a boy growing up in the countryside, Giorgio admired the exuberant beauty of nature. Later his desire for envisioning and expressing ideas unseen in nature, has led him to realize the necessity of abstraction, which if handled properly, can open doors to a myriad of amazing worlds, richer in many ways than our own reality. In May of 2008, he founded the Energy Art Movement with four artists who shared his vision of creating conceptual high-quality energetic artworks, reflected by their three primary values: quality, diversity, and artistic evolution. The movement attracted over a hundred members, and held several exhibitions with an international roster of artists. The movement held several exhibitions from Chicago to Russia between 2009-2011. 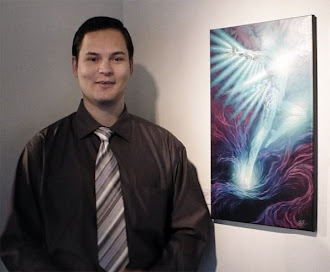 Between 2010-2015 he was focused on completing his PhD in fractal geometry, and subsequently launching his research career. He is currently engaged in a number of artistic projects about to come to fruition. Copyrights held by Giorgio Vaselli. Powered by Blogger.